We’ve had an enormous delivery of beautiful new stretch fabrics in both plain and printed styles. 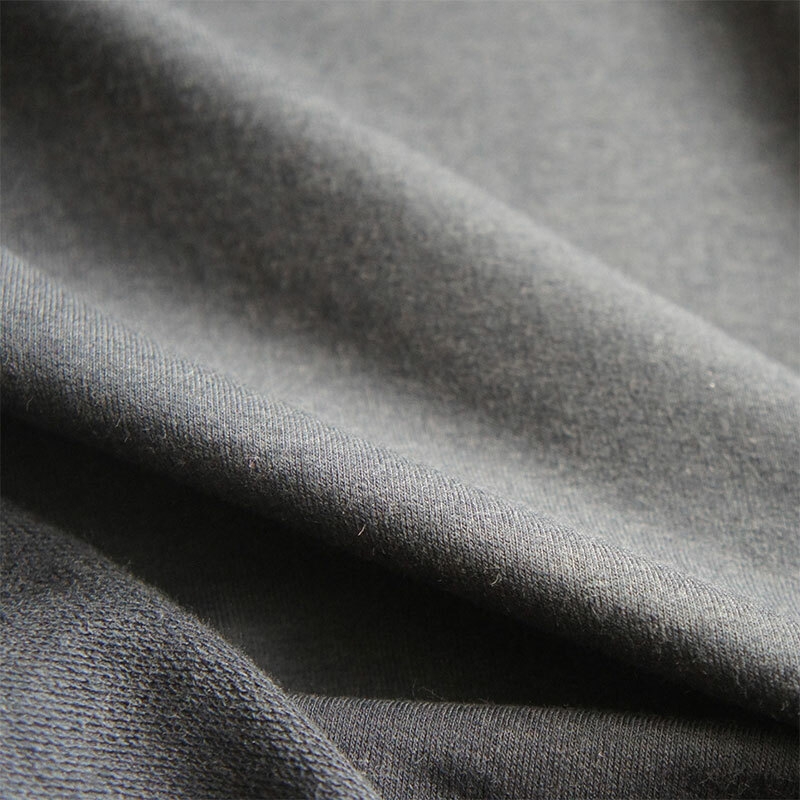 Jersey is a knit fabric that was originally made of wool in Jersey (the place), part of the Channel Islands, but as you can see above, can now be made from all sorts of different fibres. In 1916, Gabrielle “Coco” Chanel rocked the fashion industry boat by using jersey at a time when it was strictly associated with underwear. We have her to thank for jersey being used in the way it is today, at it’s now considered an excellent fabric for draped garments, including dresses, tops and t-shirts, childrenswear and lots more. The bamboo fabrics wash and iron incredibly well. What I particularly love about bamboo is that it creates a lot less piling than other similar man-made fibres and cotton, so it continues to look great over time. 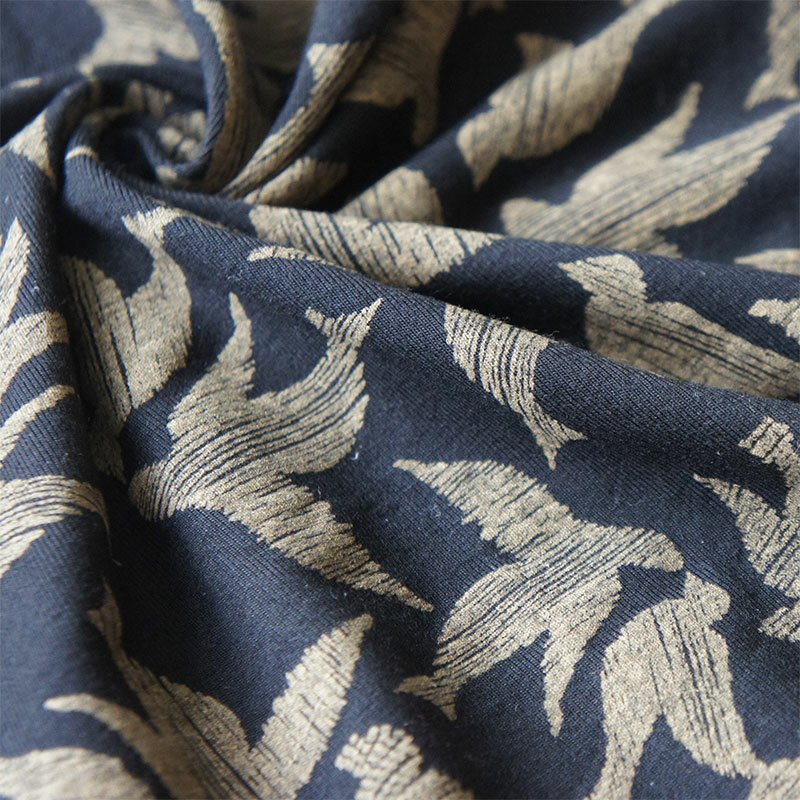 The fabric has a gorgeous, fluid drape and is incredibly soft and smooth to the touch. It’s lightweight and breathable but completely opaque. Bamboo is a natural fibre and as a fast growing raw material with incredible toxin-absorbing properties and long roots that prevent deforestation, it’s a much more sustainable option compared to non-organic cotton, which is hugely environmentally damaging. You can find out more about bamboo’s sustainable credentials here. It is also has great insulating properties, meaning that the fabric keeps the wearer warmer in the winter and cooler in the summer. As well as being great for t-shirts, dresses and even sportswear, the fabric can also be used in soft furnishings. 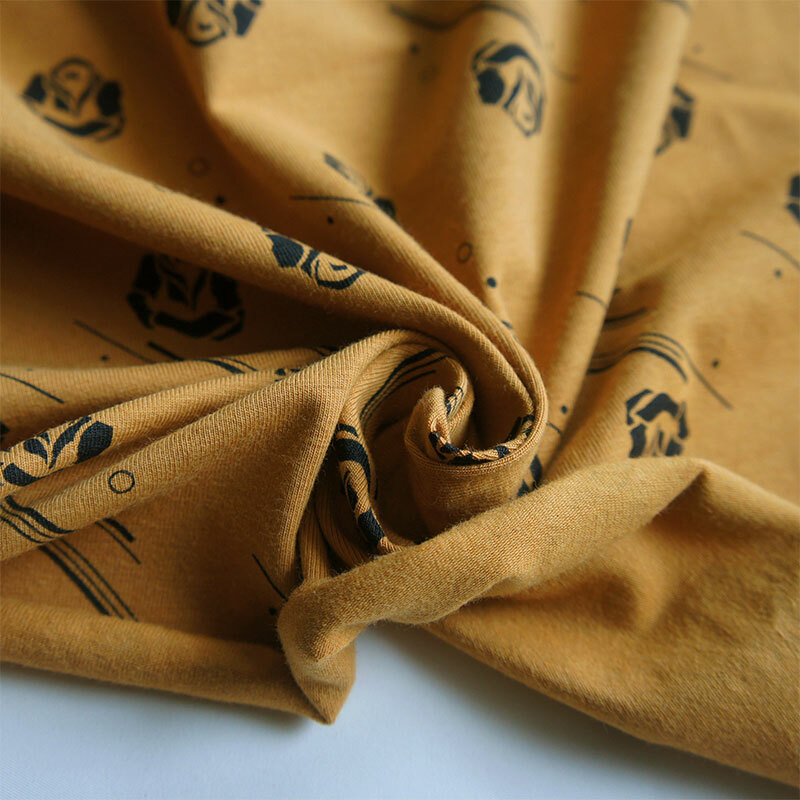 Some of our bamboo fabrics are completely exclusive and limited edition, so please do pick it up before it sells out. Ribbing fabric is used mainly as a trim for garments such as jackets and jumpers, but this is lightweight enough to use as the main fabric. This fabric has an amazing stretch, and beautiful, thick feel. We reclaimed the fabric from a high-end manufacturer in the UK and stopped it from heading to landfill. It is a heavy, opaque rib jersey, perfect for jumpers, sleepwear and sportswear. Modal is a cellulose fibre made from beechwood. Similar in feel to our ultra fluid, bamboo jerseys, these have a slightly heavier drape and even more stretch. It also has a very slight silky sheen, so it feels like butter against the skin. The modal is combined with 5% elastane, adding a fantastic pull-back, and preventing the fabric from stretching out of shape. The fabric is super absorbent, so it’s great for sports apparel, and also for designs that require a fluid drape. Zara recently incorporated Modal into their collection, read up about that here. This fabric is completely exclusive and limited edition, so please don’t miss it before it sells out. (Wholesale quantities will be available after this time). 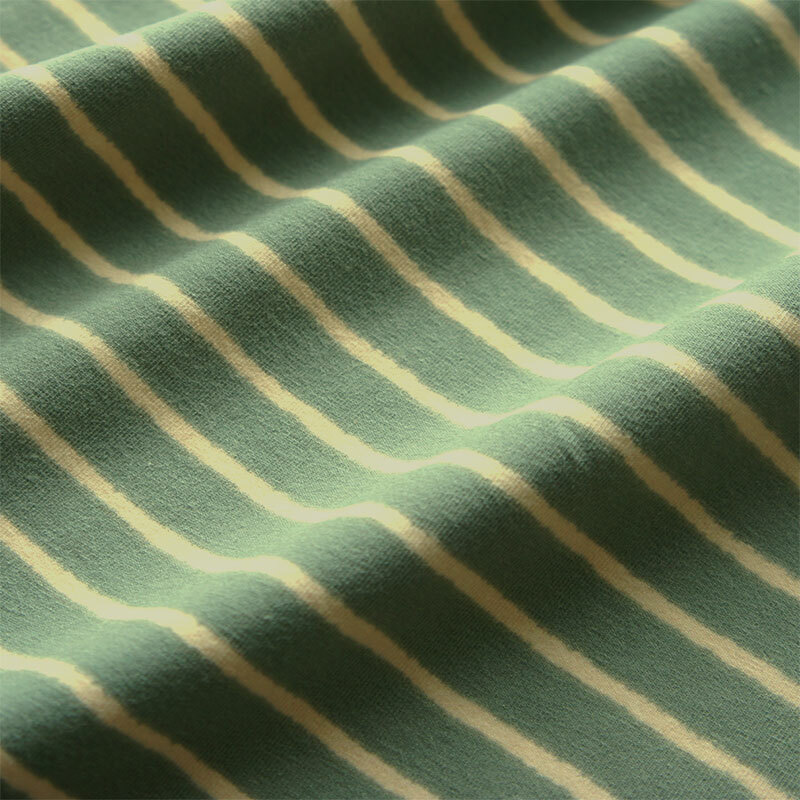 This fabric is a blend of two natural fibres beechwood (85%) and silk (15%). It is a single jersey that has been rotary printed in the UK. This means that the print is slightly raised and sits on top of the fabric’s surface. 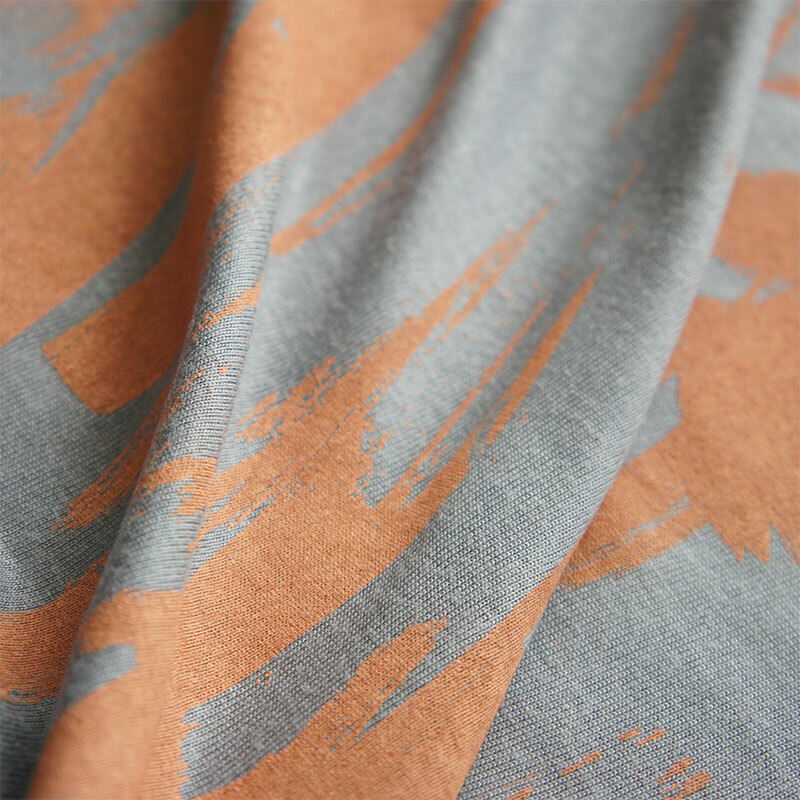 It has a slight sheen to it, so alongside the raised peach print, the fabric has an amazing depth and texture. It is a beautiful and delicate fabric, slightly see-through, ideal for more feminine styles, sleepwear, lingerie and sportswear. There is a little stretch in this fabric. It’s completely exclusive and limited edition, so please don’t miss it before it sells out. The organic cottons are single jerseys with 5% elastane to help the fabric retain its shape and adds comfort when used in clothing. It washes and irons really well and doesn’t lose any of the beautiful colours. Grown without the use of pesticides, herbicides or other chemical fertilisers, organic cotton is simply better for your health and the environment, and for the people who produce the fabrics. You can read lots more on organic cotton here. As well as being ideal for soft furnishings, this is great option for making t-shirts and dresses in particular, as it’s not as fluid as bamboo jersey so great for items that require a little more support and structure. Because organic agriculture doesn’t use toxic pesticides, choosing organic products is an easy way to help protect the environment and yourself. This fabric is completely exclusive and limited edition, so please don’t miss it before it sells out. This fabric is actually a softly structured French Terry, meaning it is smooth on the front and has an incredibly soft textured effect on the back. Combining the properties of both bamboo and organic cotton with added elastane to help the fabric retain shape and give added comfort (67% bamboo 27% organic cotton 6% elastane), this fabric is a super-charged eco textile! It’s durable enough for soft furnishings and equally ideal for making soft tailored items such as jackets, jumpers and dresses. This fabric is completely exclusive and limited edition, so please don’t miss it before it sells out. Wholesale quantities available after this time. Swatches are available for all of the jerseys. When you receive them, examine the structure: Which way does it stretch? One direction will almost always stretch more. Make a note of it and cut the pattern as directed with the more stretch facing the right way. Sleeves are usually cut width wise (most stretch), same with shirt body. Some patterns are bias cut (on the diagonal) for a lovely drape. I sometimes hear that it can be daunting to sew knits – so I thought I’d put together another post with some tips on how to sew it, to address some of your concerns. But please do let me know if you have any questions about what I’ve shared here. The best part of sewing with jersey is that it works well for most sewing patterns intended for knit fabrics. It’s the all-star in the family of knits, because it’s so versatile. You can use it for any garment, particularly those that you’d like to have added drape, like dresses or lounge trousers, or for added comfort for lots of movement such as childrenswear and activewear. And you can also use it for soft furnishings on finished products like bean bags, cushion covers and so on (I’ve not seen it used for products like curtains or table-runners, but it’s perfectly feasible). Jersey fabric is incredibly easy to care for and keep looking great. Pay attention to the fibre breakdown of your jersey to decide what sort of wash cycle your fabric requires (we’ve also outlined recommended care on each product page). Jerseys with a majority of cotton will shrink – the fabrics in the shop may shrink by up to 5%, so be sure to prewash your fabrics on a warm wash cycle and medium tumble dry cycle before sewing. Cotton jerseys can withstand a medium heat steam iron. I set my steam iron to the wool setting when working with jersey. After your garment is sewn up, you can continue to launder it on a cold-warm wash cycle and medium tumble dry cycle. I’ve found that an iron isn’t needed, as long as I hang the items as soon as it comes out of a warm dryer! I’d love to know what you think about our new jersey range. Also, if you make anything using any of them, please do remember to show us – we’d love to see.